[highlight]BUAT Application Form 2017[/highlight]: Banasthali University has released the BUAT 2017 Notification and hence it has invited the deserving and willing candidates to apply by submitting the BUAT Application Form 2017. This university is women university only female candidates can apply for this entrance examination. Interested applicants have to meet the eligibility criteria in all the aspects to register for the BUAT Online Application Form 2017 until the last date, i.e. 30th April 2017 and till 15th May 2017 with a late fee of Rs. 900/- at banasthali.org/. Banasthali University offers a wide range of engineering courses to the candidates in various streams. Banasthali University is a deemed university that was established in the year 1935 on 06th October. This is women’s university that is located in Tonk district of Rajasthan and only the female candidate can apply for BUAT 2017 in a prescribed application format on or before the last date. Those who are looking to get admission in Banasthali university are informed that it is necessary for all the applicants to register by submitting the BUAT Online Application Form 2017 on or before the last date, i.e. 30th April 2017. After that, the selected candidates will be called to appear in the Banasthali University Aptitude test that will be conducted in May 2017. This aptitude test is on university level examination. Every year a large number of female candidate is appearing for engineering admission test. Before filling the application form, the applicants should have to meet the eligibility criteria to apply for Banasthali University Aptitude Test Application Form 2017. Applicants have to go through the official portal of Banasthali University, i.e. banasthali.org/. Follow notification after visiting engineering section. Candidates have to search for “Apply Online” link and click on it. Fill all the entries in the online form. Pay the required application form fees. Do not forget to take print out of application form for future uses. Candidates need to pay Rs. 800/- till 30th April 2017 as application charges. 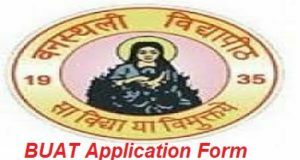 The online application submission for Banasthali University Aptitude Test has already been started in January 2017 and hence the candidates who are meeting the eligibility norms in all the aspects are invited to register online for BUAT Application Form 2017 on or before 30th April 2017. After the escaping of the last date, applicants will be able to submit the application fee with a late fee of Rs. 900 (800+100 = 900). Here we have included the complete process by following which the candidates will be easily able to register for BUAT. For any type of assistance, while applying for BUAT, you can contact us by leaving your comments at the end of the post, we will respond you as soon as possible.